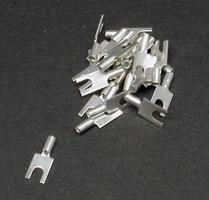 This is a Package of 24 #3 Spade Connectors from Atlas Model Railroad Co. This is the N Scale Southern Pacific General Service Drop Bottom Gondola Kit from the Tichy Train Group. 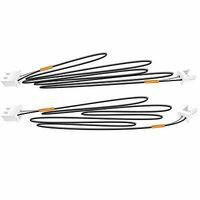 This is the Extension Cables from the Just Plug Series by Woodland Scenics. This is the Easy Peasy Shorty Passenger Car Lighting Set - Fits Most HO Scale 72' Cars from Rapido Trains Inc. These are New Bright Curved Track Sections. Suitable for Ages 8 & Older. 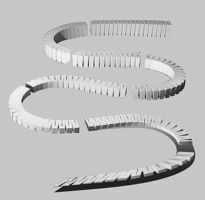 This Package Contains 8 Styrofoam Pieces of 2% Grade Incline 2.5" wide with a 4" Rise in 24" long each. 16' total run. This is Step-2 among the simplified and improved 5-step layout system for beginners and advanced modelers. It's a Woodland Scenics Subterrain Lightweight Train Layout System for creating an outdoor environment. This is the N Scale Southern (Green) Prairie 2-6-2 Steam Locomotive and Tender by Bachmann. Suitable for Ages 14 & Older. This is a Premium HO Scale Silver Series 40' Norfolk and Western Quad Hopper Car from Bachmann. It's for experienced train collectors. Woodland Scenics' Fine Turf (Green Grass) is a Finely Ground, Colorfast, Nonmagnetic, Foam Material For Use in Creating Grass and Soil Effects. This is the HO Scale Insta-Fence Kit Approx 160 Scale Feet by Bar Mills. This is Woodland Scenics' 1/2 Gallon Lightweight Hydrocal. The Atlas Passenger Station is a composite design combining the more attractive features from several of the many styles of stations erected by the nation's railroads, in countless numbers throughout the country. They served small towns and the suburban communities of large metropolitan areas from 1890 to the World War I era. 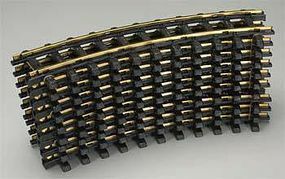 This is the HO Scale Highway Guard Rail Kit (6) from Pikestuff. This is a Premium HO Scale Silver Series 40' CSX Quad Hopper Car from Bachmann. It's for experienced train collectors. This is the The Tortoise(TM) Switch Machine from Circuitron. This is the HO Scale Painted Red and Unlettered 1860-1880 Coach Passenger Car from the Silver Series by Bachmann. Suitable for Ages 14 & Older. Add graphic touches and create your own Custom Layout with these Woodland Scenics Roman, R.R. Gold Dry Transfer decals.